Chang is a lager beer with a pleasant, full flavour, subtle fruit and hop aroma, delivering a natural easy-to-drink brew. Brewery 1. Cosmos Brewery (Thailand) Co. Ltd.
Archa Beer was first launched in July 2004 to expand the market share, particularly in the standard and premium product groups, and to respond to increasing demands from a new generation of beer drinkers who prefer smooth beer with lower alcohol content. 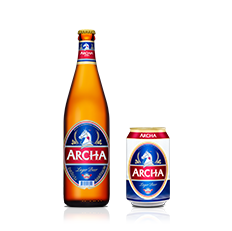 Archa Beer thus serves as another alternative for beer drinkers. 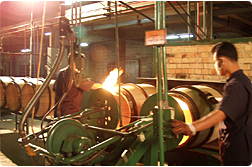 Type of Content Bottle 630 ml., Can 320 ml. Brewery 1. Beerthip Brewery (1991) Co., Ltd.
2. Beer Thai (1991) Plc. FEDERBRÄU is a German inspired quality beer brewed using the finest imported German malt. Using only a single source of German malt in the brewing process, FEDERBRÄU offers a uniquely German beer experience that is easy to drink and refreshing. With 5% ABV, FEDERBRÄU is a smooth tasting authentic German beer flavor. Brewery The Cosmos Brewery (Thailand) Company Limited.